Quickly expand single words into functional phrases and sentences without taxing the motor system! The Kaufman Workout Book includes workouts designed to help children with CAS and other speech sound disorders develop expressive language skills. It contains scripting and cueing techniques plus targets word retrieval and grammatical development. 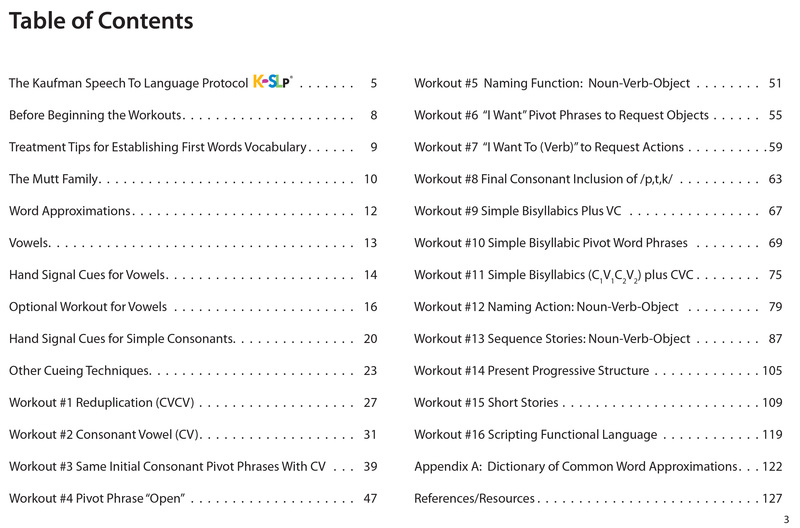 The Kaufman Workout Book includes 16 reproducible, motor-speech coordination workouts to stabilize the pronunciation of consonant-vowel combinations and promote rapid development of expressive language skills while controlling for oral-motor difficulty. The colorful, engaging artwork in the activities feature the Mutt Family characters and focus on consonant-vowel combinations with /m, p, b, t, d, n, h/. Made in the USA. Each workout explains what skill is being targeted, how to perform the exercise with visual and tactile hand cues, and specific help that is to be offered to the child. The straightforward style of this book allows parents/caregivers to reinforce the work done by the SLP and the content is reproducible for creating home programs. Kaufman What's In Your Doghouse? : The therapy game you've been waiting for is here! This engaging, hands-on, structured therapy tool will help children with CAS or developmental delays bridge motor speech to expressive language skills without taxing the speech motor planning system. Features 16 fun motor-speech coordination workouts. Colorful, engaging artwork featuring the familiar Mutt Family characters. Enjoyable story themes grab and hold attention. Visual & tactile hand cues for consonants and vowels. Fully reproducible and great for home programs. Hard cover spiral bound book with 127 pages (12" x 9" color-printed pages). Zoom in to increase font size. For SLPs working with young children on consonant-vowel combinations and on expressive language skills. Visual referents are most appropriate for children ages 2 to 10. This material may also be beneficial as home programs for parents who are working closely with their child's SLP to reinforce therapy sessions.